Sauron is a responsive WordPress multipurpose theme. This SEO-friendly WordPress theme uses one page scroll and parallax technology with easy set-up sticky menu. It has wide list of customizable features including full-width posts grid, front page builder, full screen lightbox slideshow, layout editor and social sharing options. It is compatible with top WordPress plugins such as WPML(multilingual ready), JetPack, Contact Form 7, bbPress, BuddyPress, Photo Gallery and various e-commerce plugins. A special accent is made on its cross-browser compatibility, mobile friendly design and responsive features. The theme is retina ready with clean flat design. 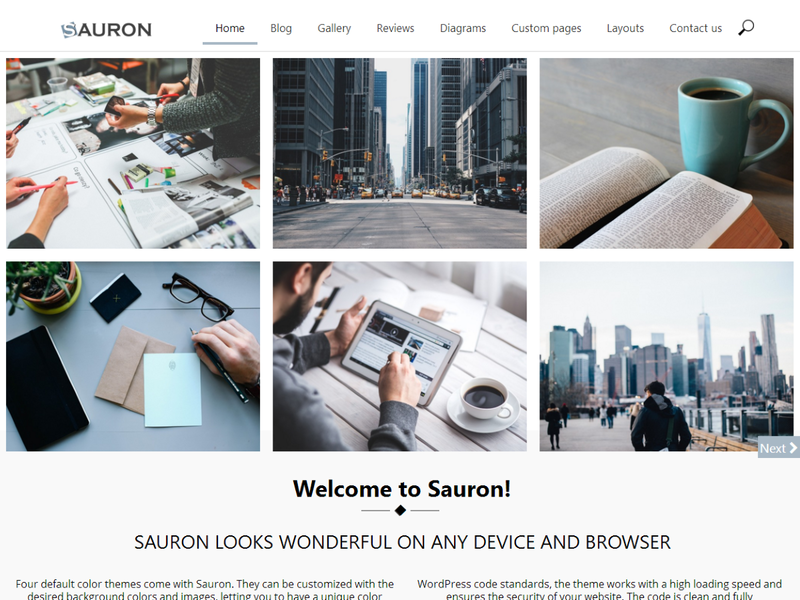 Sauron also can be fully customized to be used for business portfolio, company corporate, commercial, non-profit organization, blog, photography, personal, restaurant, construction, health and other sites. Demo URL: https://themedemo.web-dorado.com.